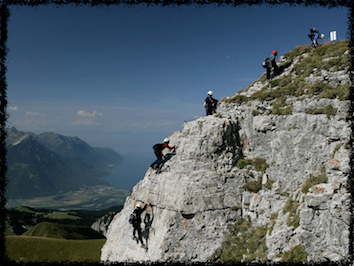 The Via Ferrata allows you to enjoy wonderful views from the mountain tops. On rocky terrain, you climb with cables, ladders, and other diverse routes whilst safely attached to a guide. You will be using two carabiners, a lanyard and a belt, which the well-experienced Guide will teach you the basic techniques before you begin. Enjoy this unforgettable moment. There are several choice of routes, and you can select the one that best fits your needs and your desired level of difficulty.